The skull is the bony skeleton of the head. Excluding ear ossicles, it is made of 22 bones. All the bones of skull, joined together by sutures, are immobile and create the cranium, with the exception of mandible (bone of lower jaw). On the other hand, the two terms skull and cranium are used synonymously. Cranial vault/calvaria/ brain box is an upper dome-shaped part which covers the cranial cavity consisting of brain. It is connected to the skull base below. The Calvaria and skull base together are known as cranial skeleton/ cranium. The lower anterior part is named facial skeleton, which contains mandible. The cranium (cranial skeleton) is a powerful and stiff container for the brain, while the facial skeleton is a fairly delicate and light basis for face. 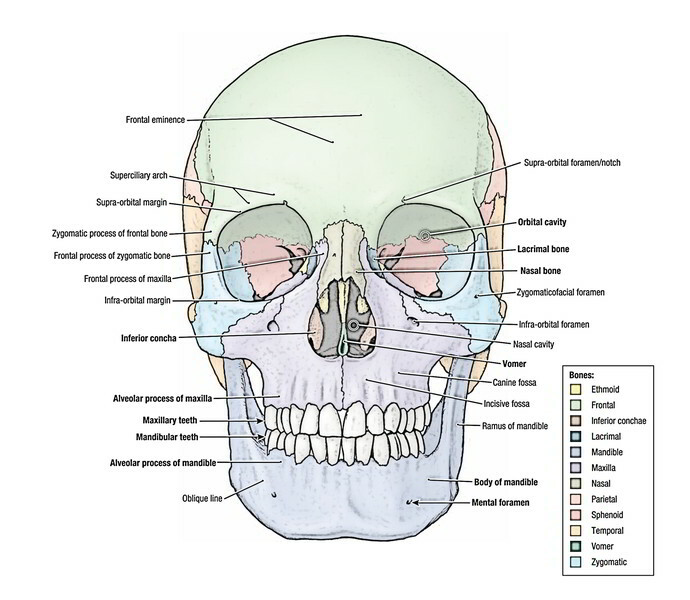 The facial skeleton is located below the anterior part of the cranium in human beings. Many anatomists use alternative terms, neurocranium for the cranial skeleton and viscerocranium for the facial skeleton. Gives case for protection of the brain and its coverings (meninges). Gives cavities for adjustment of organs of special senses like vision, hearing, equilibration, odor and flavor. Gives openings for the passage of air and food. Adapts teeth and jaws for mastication. The term cranium (Gk. 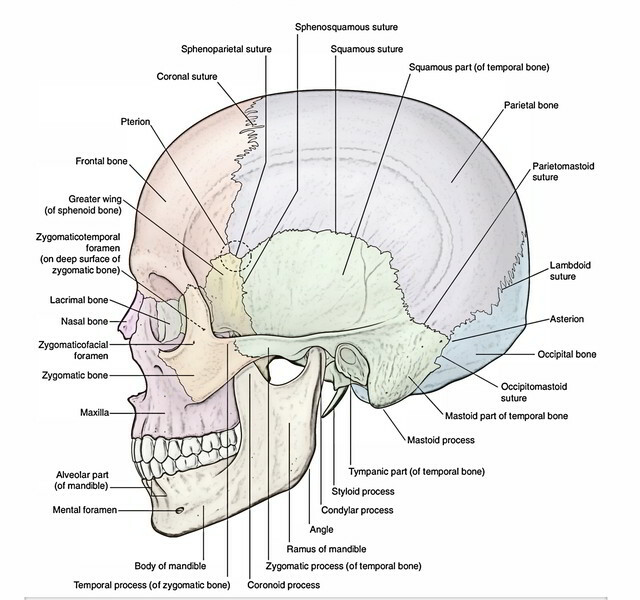 cranium = skull) is occasionally utilized to mean the skull without mandible. The skull is created from 22 bones, excluding ear ossicles. Cranial skeleton, being composed of 8 bones, out of which 2 are matched and 4 unpaired. The bones of the skull are linked at immovable joints referred to as sutures. The connective tissue connecting the bones is named sutural ligament. Exception to this rule is mandible for it’s linked to the cranium by synovial temporomandibular joint that are freely movable joints. All the bones of the skull are immovable with the exception of the mandible which allows free movements. The ear ossicles inside the middle ear are also mobile, but conventionally they’re not comprised in the skeleton of the head. 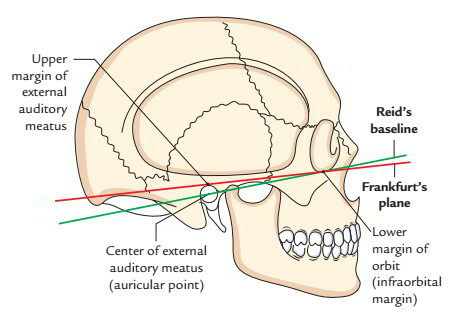 It’s the position of skull where the orbital cavities are directed forwards and lower margins (infraorbital margins) of the orbits and upper margins of external acoustic meatuses is located in the same horizontal plane (Frankfurt’s plane). A horizontal line created by joining the infraorbital margin and the centre of external auditory meatus is referred to as Reid’s baseline. The study of skull as a whole is of greater relevance to the majority of health professionals compared to the study of unneeded aspects of the individual bones. The skull can be studied from outside or from inside (after removing the calvaria or skull cap). The external features of the skull are studied from 5 distinct aspects, viz. When the skull is seen from superior aspect it’s referred to as norma verticalis; when from posterior view, norma occipitalis; when from anterior aspect, norma frontalis; when from lateral aspect, norma lateralis; and when from inferior aspect, norma basalis. When the skull is seen from above, it seems oval, being wider posteriorly than anteriorly. Frontal bone (squamous part) anteriorly. Parietal bones (coupled) on every side of midline. Occipital bone (squamous part) posteriorly. These bones are connected by the following 3 sutures. Coronal suture (L. = a crown), between frontal and 2 parietal bones. It crosses the cranial vault from side-to side. Sagittal suture (L. = an arrow), between 2 parietal bones. It is located in the median plane. Lambdoid suture, between occipital and 2 parietal bones. It’s shaped like the letter lambda, therefore its name. The metopic suture sometimes exists in the median plane of the frontal bone in 3-8% cases. It symbolizes the remnants of suture between the 2 halves of the frontal bone in fetal skull, which develops by individual centers of ossification. Disjunct sutural bones, ossified from different centers are frequently observed along the lambdoidal suture. Bregma: It’s a point at which coronal and sagittal sutures meet. Parietal eminence/tuber: It’s an area of maximum convexity of parietal bone. Vertex: It’s the maximum point on the skull. It is located on the sagittal suture near its middle and is situated several centimeters behind the bregma. Parietal foramen: It’s a small foramen in parietal bone near sagittal suture, 2.5-4 cm in front of lambda. Obelion: It’s a point on sagittal suture between the 2 parietal foramina. When the skull is seen from behind, it seems convex upwards and on sides, but flattened below. Parietal bones, superiorly 1 on every side. Occipital bone (squamous part), inferiorly. Mastoid part of temporal bone, inferolaterally on every side. Lambdoid suture, between occipital and 2 parietal bones. Occipitomastoid suture, between occipital and mastoid part of temporal bone. Parietomastoid suture, between parietal and mastoid part of temporal bone. Lambda: It’s the point at which sagittal and lambdoid sutures meet. External occipital protuberance: It’s a median bony projection about midway between the lambda and the foramen magnum. The most notable point of the external occipital protuberance is named inion. Superior nuchal lines: All these are curved bony ridges passing laterally on every side from external occipital protuberance. In certain cases arch dim bony ridges are observed 1 cm above the superior nuchal lines. They’re referred to as greatest nuchal lines. External occipital crest: It’s a vertical ridge between the external occipital protuberance and posterior margin of the foramen magnum. Inferior nuchal lines: All these are curved bony ridges passing laterally on every side from middle of the external occipital crest. Mastoid foramen: It’s present near the occipitomastoid suture. In frontal view, the skull seems oval, being wider above and narrower below. Frontal region created by frontal bone. Bulges of the cheek created by zygomatic bones. Bony external nose and anterior nasal aperture. Upper and lower jaws bearing teeth. The frontal region or the forehead is composed by the squamous part of the frontal bone. Below on every side of median plane, it articulates with all the nasal bones. Frontal region presents these features: superciliary arches, glabella and frontal eminences. All these really are the openings of 2 orbital cavities on the face. Every opening is present above and lateral to the anterior nasal aperture. It’s quadrangular in shape and presents 4 margins, viz. supraorbital, lateral, infraorbital and medial. 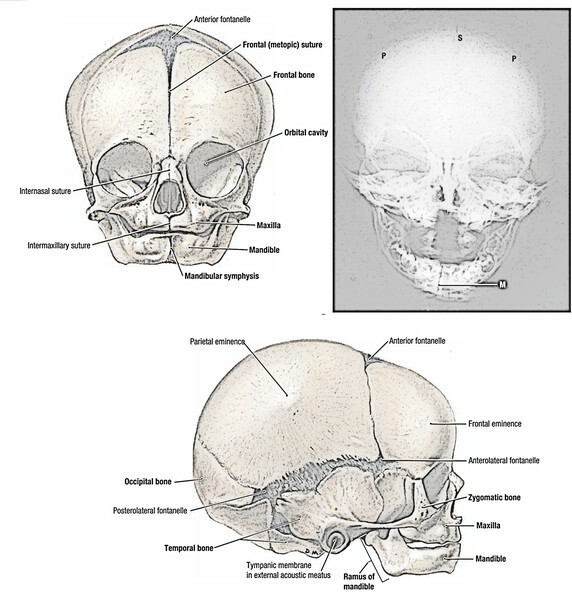 The supraorbital margin is composed completely by the frontal bone. 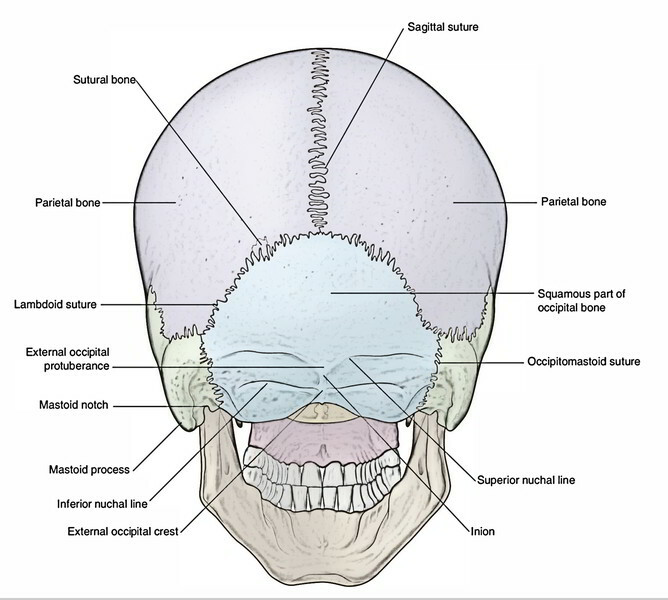 At the junction of its lateral two-third and medial one-third, there’s a notch referred to as supraorbital notch (or foramen in a few skulls), via which enters the supraorbital nerve and vessels. 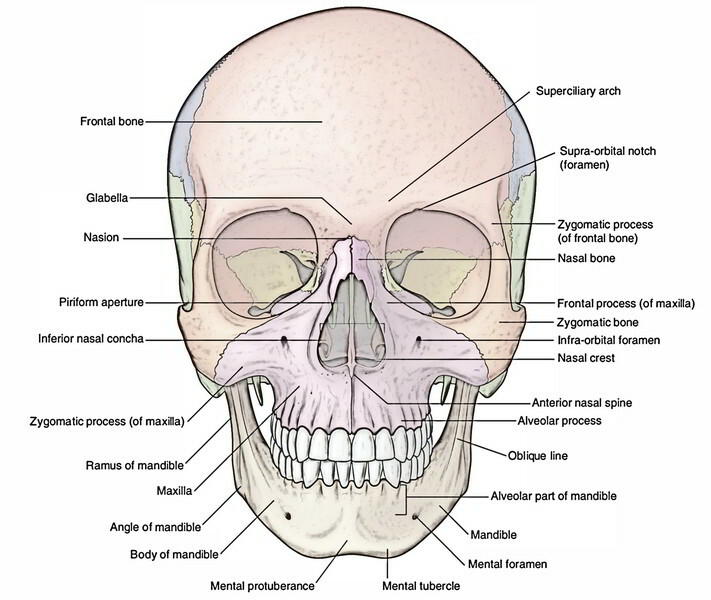 The lateral orbital margin is composed by the frontal process of zygomatic bone and zygomatic process of frontal bone. The infraorbital margin is composed by the zygomatic bone laterally and the maxilla medially. Below this margin the maxilla presents an opening termed infraorbital foramen via which enters the infraorbital nerve and vessels. The medial orbital margin is ill defined as compared to other margins. It’s created by the frontal bone above and the anterior lacrimal crest of the maxilla below. Every bulge is situated on the lower and lateral side of the orbit and rests on the maxilla. It’s marked by a foramen referred to as zygomaticofacial foramen. The bony external nose is composed by the nasal bones and maxillae. 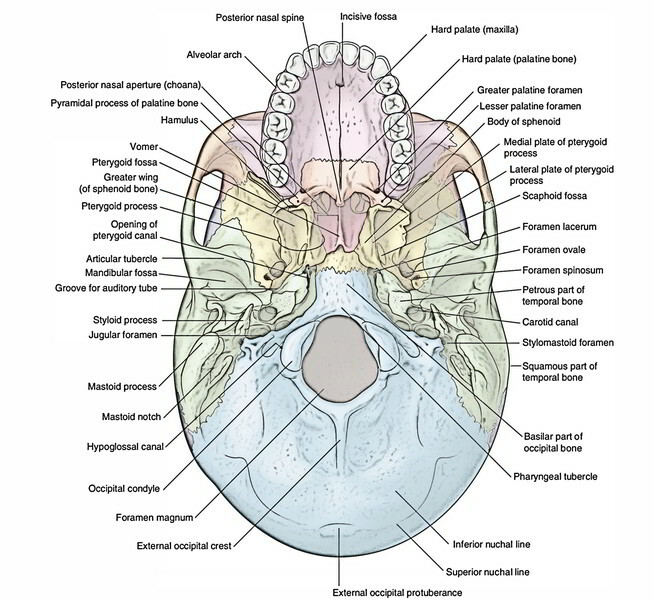 It ends in front and below as piriform aperture of the nose termed anterior nasal aperture that is bounded above by the nasal bones and laterally and below on every side by the nasal notches of the maxillae. The 2 nasal bones joint in the midline with every other at internasal suture, posteriorly with frontal process of maxilla and superiorly with frontal bone in the frontonasal suture. Anterior nasal spine is a sharp bony projection which indicates the assembly of the 2 maxillae in the lower boundary of the anterior nasal aperture. The anterior surface of the maxilla, which presents: nasal notch medially; infraorbital foramen 1 cm below the infraorbital margin; incisive fossa above the incisor teeth; canine fossa lateral to canine eminence generated by the root of canine tooth. The lower jaw is composed by the mandible. The upper border, also referred to as alveolar process of the mandible, carries the lower teeth. Frontal bone, creating the forehead. Nasal bones (left and right), creating the bridge of the nose. Maxillae (left and right), creating the upper jaw. Zygomatic bone (left and right), creating the malar prominences. Mandible, creating the lower jaw. Glabella, a median elevation above the nasion and between the superciliary arches. Nasion, a median point in the root of the nose where the internasal and frontonasal sutures meet. Anterior nasal spine, a sharp bony projection in the median plane, in the lower boundary of the piriform aperture. Symphysis menti, a median ridge joining 2 halves of the mandible. Mental protuberance, a triangular elevation at the lower end of symphysis menti. Mental point (gnathion), middle point of the base of the mandible. Frontal bulge, a low rounded elevation above the super ciliary arch. 3 foramina being located in same vertical plane, viz. a) Supraorbital notch or foramen, in the junction of medial one-third and lateral two-third of the superior orbital margin. b) Infraorbital foramen, 1 cm below the infra-orbital margin. c) Mental foramen, below the time between 2 premolar teeth. An oblique line on the body of the mandible, going between mental tubercle and lower end of anterior margin of ramus of the mandible. The bones viewed on the lateral aspect of skull are frontal, parietal, occipital, temporal, sphenoid, zygomatic, mandible, maxilla and nasal. Parietosquamosal suture, between parietal and squamous part of temporal bones. Temporal line: It commences at the frontal process of the zygomatic bone, arches upwards and backwards across the parietal bone where it carves into superior and inferior temporal lines. Tracked behind, the superior temporal line fades away on the other hand notable inferior temporal line bends downwards and forwards across the squamous part of the temporal bone as the supramastoid crest that is constant with the superior root of zygomatic process. Zygomatic arch: It’s a horizontal bar of bone created by temporal process of zygomatic bone and zygomatic process of temporal bone. It presents 2 surfaces (outer and inner) and 2 edges (upper and lower). The upper border is constant in front together with the temporal line via posterosuperior border of the zygomatic bone and behind with the supramastoid crest. The posterior end of lower border is marked by a tubercle termed tubercle of root of zygoma. 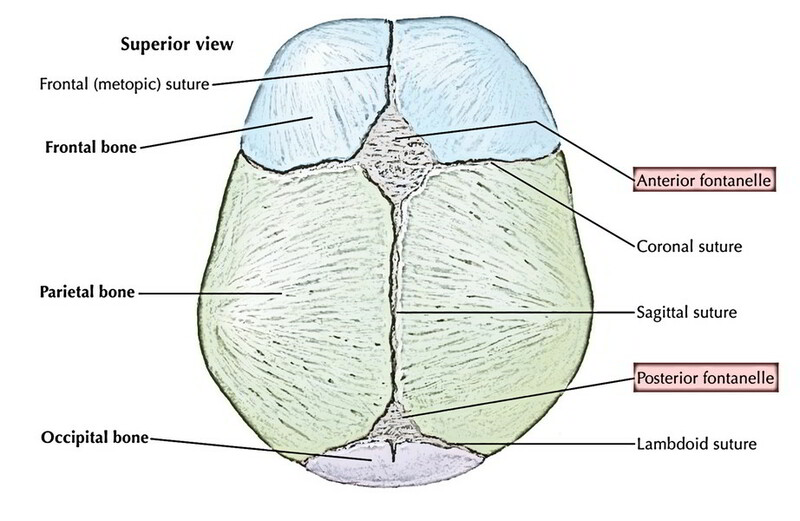 Here zygomatic process of temporal bone divides into anterior and posterior roots. The anterior root (articular tubercle) enters medially creating anterior boundary of mandibular fossa. The posterior root creates lateral boundary of mandibular fossa and ends behind into a small postglenoid tubercle. External acoustic meatus: It’s an opening just below the posterior root of the zygoma. Its anterior wall, floor and lower part of the posterior wall are created by tympanic part of the temporal bone on the other hand; its roof and upper part of the posterior wall are created by the squamous part of the temporal bone. Suprameatal triangle (triangle of McEwen): It is a small depression posterosuperior to the external auditory meatus. It’s bounded above by supramastoid crest in front by posterosuperior margin of external acoustic meatus and behind by a vertical tangent to the posterior margin of the meatus. The mastoid antrum is located 1.25 cm deep to this triangle. A small bony projection named suprameatal spine (spine of Henle) may show up in the anteroinferior part of the triangle. Mastoid process: It’s a mamma-like process of temporal bone going downwards behind the meatus. Asterion: It’s a meeting point of parietomastoid, occipitomastoid and lambdoid sutures. Styloid process: It’s a thin long bony process of temporal bone, anterolateral to the mastoid process below and behind the external auditory meatus. Its base is partially ensheathed by tympanic plate. It’s pointed downwards forwards and somewhat medially. Temporal fossa: It’s a shallow depression on the side of the skull bounded above by the temporal line and below by zygomatic arch and supramastoid crest (laterally) and infratemporal crest of sphenoid (medially). It interacts with all the infratemporal fossa via a gap between the zygomatic arch and the side of the skull. 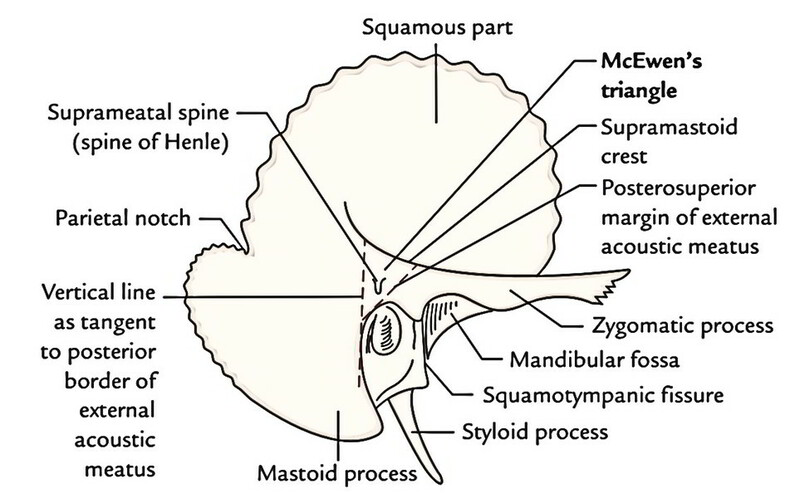 The region in the anterior part of the temporal fossa where 4 bones (frontal, parietal, squamous temporal and greater wing of the sphenoid) meet to create an H-shaped suture is termed pterion. It’s situated 4 cm above the midpoint of the zygomatic arch. Infratemporal Fossa: It’s the region on the side skull, below the zygomatic arch. It’s bounded medially by lateral pterygoid plate and laterally by ramus of the mandible. Pterygomaxillary fissure: It’s a triangular gap between the body of maxilla and lateral pterygoid plate of sphenoid. The infratemporal fossa interacts together with the pterygopalatine fossa via this fissure. 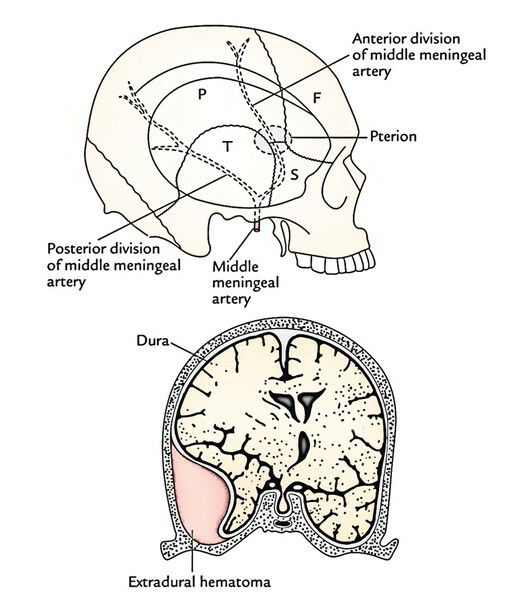 Fracture of pterion: The pterion overlies the anterior section of middle meningeal artery, which ruptures following a strike in this region to create an extradural hematoma [a clot formation between the skull bone and the dura mater]. The clot, if big, may compress the brain resulting in unconsciousness or even death. Consequently, it ought to be taken out as early as possible by trephination or craniotomy. Anterior transverse line, which enters along the posterior-free margin of the hard palate. Posterior transverse line, which enters along the anterior margin of the foramen magnum. It’s created by hard palate and alveolar processes of the maxillae. Alveolar arch: The alveolar processes of two maxillae create a U-shaped ridge of bone referred to as alveolar arch, which bears the sockets for the roots of upper teeth. Hard palate: It’s created by 2 pairs of bony processes: palatine processes of maxillae in front (anterior two-third) and (b) horizontal plates of palatine bones behind (posterior one-third). The hard palate presents intermaxillary, interpalatine and palatomaxillary sutures. It stretches from posterior margin of the hard palate to an imaginary transverse line that crosses the anterior margin of the foramen magnum. Posterior border of vomer: Both posterior nasal apertures (choanae) are divided by the posterior border of vomer. Broad bar of bone: It’s created by the fusion of the body of sphenoid and basilar part of the occipital bone. It’s indicated in the median plane by pharyngeal tubercle, a little in front of foramen magnum. Pterygoid process: This process projects downwards from the junction between the body and greater wing of sphenoid behind last molar tooth. It splits into medial and lateral pterygoid plates that are divided from every other by pterygoid fossa. Every plate has a free posterior border. The upper end of posterior border of medial pterygoid plate encloses a triangular depression referred to as scaphoid fossa and the lower end carries a hook like process termed pterygoid hamulus. Anterior margin creates the posterior margin of inferior orbital fissure. Anterolateral margin creates the infra-temporal crest. Posterolateral margin, articulates with all the squamous part of temporal bone. Posteromedial margin, articulates with petrous part of temporal bone. Foramen spinosum is a small circular foramen at the base of spine of sphenoid. Foramen ovale, a large oval foramen anterolateral to the upper end of the posterior border of the lateral pterygoid plate. Emissary sphenoidal foramen (foramen of Vesalius), a small foramen occasionally present between the foramen ovale and the scaphoid fossa. Canaliculus innominatus, an extremely small foramen gift between foramen ovale and spinosum. Spine of sphenoid is a small sharp bony projection posterolateral to the foramen spinosum. Sulcus tubae (groove for auditory tube): It’s a groove between the posterolateral margin of greater wing of the sphenoid and petrous temporal bone. It lodges the cartilaginous part of the auditory tube. Inferior surface of the petrous temporal bone: It’s triangular and presents an apex, which creates its anteromedial end. The apex is perforated by upper end of carotid canal and divided from the sphenoid by foramen lacerum. Downward edge of tegmen tympani: It breaks up the squamous tympanic fissure into petrotympanic and petrosquamous parts. Fracture/necrosis of spine of sphenoid: 2 nerves are associated with the spine of sphenoid: auriculotemporal nerve on its lateral aspect and chorda tympani on its medial aspect. Both these nerves carry secretomotor fibres to salivary glands– the auriculotemporal nerve to the parotid and chorda tympani to the submandibular and sublingual salivary glands. Both these nerves would be damaged following fracture or necrosis of the spine. This may lead to reduced salivation and decline of taste sensations in the anterior two-third of the tongue. It’s behind the imaginary transverse line passing along the anterior margin of the foramen magnum. 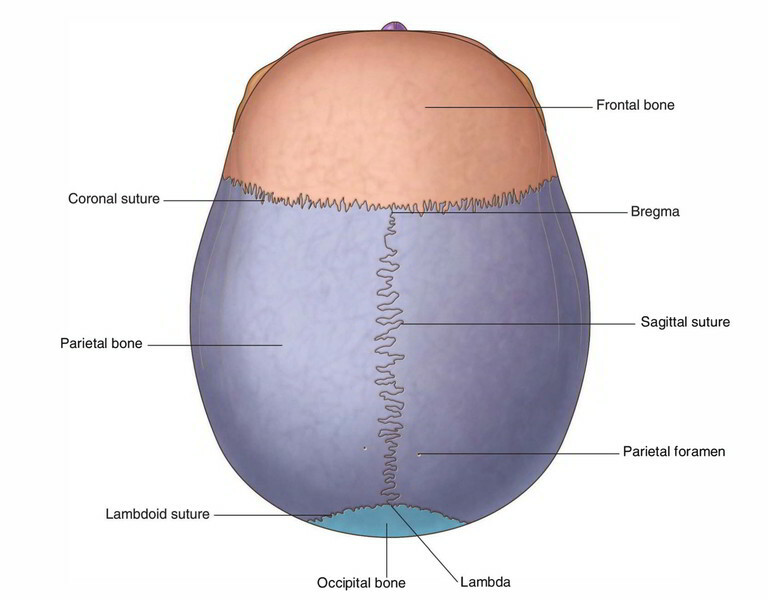 Occipital condyles: These are oval condylar processes, one on every side of foramen magnum. Hypoglossal canal: It’s found anterosuperior to occipital condyle. Condylar fossa: It’s small fossa found behind the occipital condyle. Occasionally it’s perforated by a canal, named condylar (posterior condylar) canal. Jugular process of occipital bone: It is located lateral to occipital condyle and creates the posterior boundary of jugular foramen. Jugular foramen: It’s a large elongated foramen at the posterior end of the petro-occipital suture. Its anterior wall is hollowed out to create the jugular fossa. Tympanic canaliculus: It opens on the thin edge of the bone between the jugular fossa and the lower end of the carotid canal. Stylomastoid foramen: It’s situated posterior to the root of the styloid process. 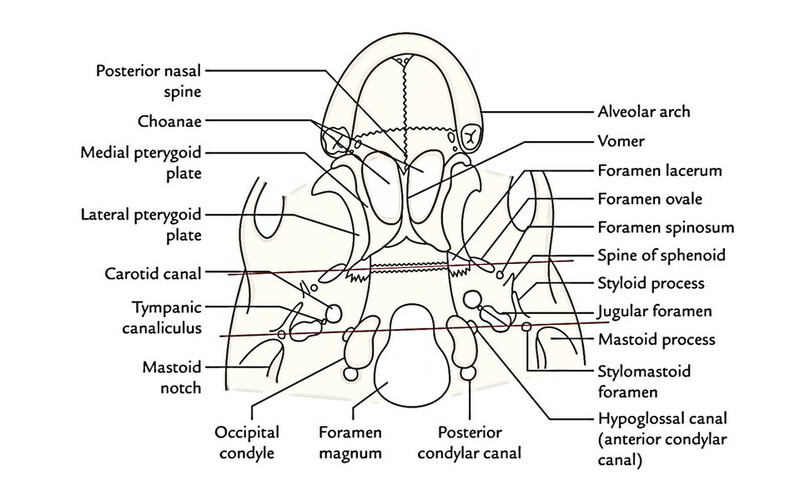 It’s fascinating to notice that foramen ovale, foramen lacerum and line of fusion of the body of the sphenoid with basilar part of occipital bone is located in same transverse line. Likewise, anterior border of mastoid process, stylomastoid foramen, jugular foramen and hypoglossal canal is located in exactly the same transverse line. To compare skulls of different races and species, the physical anthropologists require different measurements of the skull. This process is referred to as craniometry. 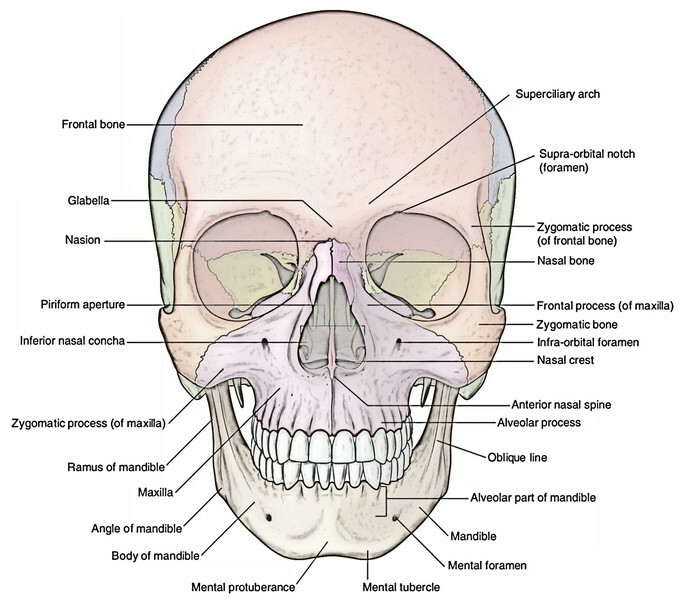 Gnathion: the midpoint of the chin at lower border of the mandible. Prosthion: lowest point on the upper jaw between the central incisors. Nasion: junction of nasal and frontal bones. Glabella: midpoint in the level of superciliary arches. Bregma: junction of coronal and sagittal sutures. Lambda: junction of sagittal and lambdoid sutures. Opisthocranion (occipital point): the most posteriorly projecting point on the occipital bone. Inion: tip of external occipital protuberance. Opisthion: central point on the posterior edge of the foramen magnum. Basion: central point on the anterior edge of the foramen magnum. Pterion: region where frontal, parietal, greater wing of sphenoid and squamous part of temporal bones meet. Dacryon: junction of lacrimomaxillary and fronto maxillary sutures. Gonion: outer side of the angle of the mandible. Porion: point on the posterior root of the zygomatic arch above the middle of the upper border of external auditory meatus. Asterion: region where occipital, parietal and temporal bones meet. Maximal cranial length: From middle of glabella to opisthocranion. Maximus cranial width: Best width at right angle to the median plane. Cranial height: From basion to bregma. (Maximum cranial width/ Maximum cranial length) * 100. If maximum width of cranium is less than 75% of its maximum length, it’s termed dolichocephalic skull (long headed individual). If maximum width of cranium is more than 80% of its maximum length it’s referred to as brachycephalic skull (broad headed individual). If ratio between maximum width of cranium and maximum length of cranium is between 75% and 80%, it’s named mesaticephalic. The eye-catching attribute of the newborn skull is the enormous size of its cranium and comparatively small size of its facial skeleton. In newborn, the facial skeleton creates about 1/7th of the cranium. The facial skeleton is small and is composed of miniature collection of bones, bunched under the anterior part of the cranium. The tremendous size of the cranium is because of rapid development of the brain. The brain reaches 25% of its mature size at birth and 75% by the age of FOUR years. The size of facial skeleton at birth is because of rudimentary phase of the mandible and maxillae, non-eruption of teeth and the small size of the maxillary air sinuses and the nasal cavity. The bones of vault of skull are ossified in membrane. At birth, it’s partially ossified and 6 unossified regions are viewed between the bones that are termed fontanelles. The fontanelles serve 2 essential functions, viz. Enables some overlapping of the skull bones (moulding) during childbirth. Allows development of the brain. Number of fontanelles: There are 6 fontanelles at birth situ-ated at the 4 angles of the parietal bones. Two are therefore, median (anterior and posterior) and four are lateral two (sphenoidal and mastoid) on every side. The anterior fontanelle is situated in the location where the two parietal bones and the two halves of the frontal bone come close together. It’s largest and diamond shaped. It measures about 3-8 cm in length and 2-5 cm in breadth. The posterior fontanelle is situated in the junction of the sagittal and lambdoid sutures. It’s triangular in shape. The sphenoidal (anterolateral) and mastoid (posterolateral) fontanelles are situated in the sphenoid and mastoid angles of parietal bones. They’re small and atypical. Posterior fontanelle closes shortly after arrival, lateral fontanelles shut inside a couple of weeks of arrival and anterior fontanelle shuts by 2 years old. All fontanelles shut around arrival with the exception of anterior fontanelle which shuts by 2 years old. The anterior fontanelle is largest and of great clinical value. The level of tenseness of the membrane supplies an index of the intracranial pressure. An abnormal depression of membrane suggests dehydration (insufficiency of the body fluids). Further, the anterior fontanelle allows an access to the superior sagittal sinus as it is located just underneath it in the midline. Via its lateral angle a needle could be passed into the lateral ventricle of the brain. The tympanum is a well grown cavity at birth. The mastoid process will not start to grow until the ending of the second year. Before the mastoid process grows, the facial nerve is a subcutaneous structure and is in danger of being cut by an incision supporting the ear, if it goes too far down. In adult, it is 2.5-3.8 cm from the surface, being shoved to the base of the skull by the development of mastoid process. In babies, the middle ear cavity is divided from temporal lobe of brain only by a thin strip of cartilage, linking the squamous and petrous parts of temporal bone. This cartilaginous strip is quite thin and is located underneath the dura mater and temporal lobe of the brain. Hence, infection of middle ear may propagate via this cartilage to cause an extradural or temporal lobe abscess. Frontal air sinus doesn’t exist at birth. It starts to grow during the very first year and reaches its complete development between 15th and 20th year. Maxillary air sinus is rudimentary at birth. It reaches its complete development between 15th and 20th year. At birth, mandible is in two halves, united by the fibrous tissue in the symphysis menti. At birth, frontal bone is in two halves, united by the fibrous tissue in the midline. If it persists in the adult, it’s termed metopic suture. Both these are connected by a part of hyaline cartilage (synchondrosis). It’s responsible for development of skull in length. All the bones of the skull are in the process of ossification at birth with the exception of styloid process and the perpendicular plate of ethmoid. All these are small irregular bones seen in the sutures. They’re created by added ossification centers that could happen in or near sutures. They’re most numerous in the lambdoid suture. Occasionally they take place at fontanelles, notably in lambdoidal and mastoid fontanelles. In lambdoidal fontanelle they may represent interparietal bone. A separate bone at lambda is named Inca bone or Goethe’s ossicle. In the mature skull they’re most common in the lambda and in the asterion. Scarcely can they possibly be viewed at pterion (epipteric bone) and at bregma (os Kerckring). The wormian bones are typical in hydrocephalic skulls. The sutural bones are often small and bilateral. The Inca bone was common in the skull of Incas and remains present in their own Andean descendants.